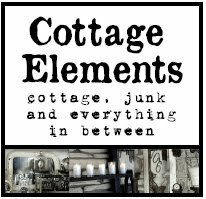 Cottage Elements: FUNKY JUNQUE - One of My New Favorite Things! On a visit to to see my son at college in Fargo, that's right Fargo - ya sure you betcha, I discovered one of my new favorite things. A small store located on a quaint street in beautiful downtown Fargo named "Funky Junque". It seems a little out of place from what you would assume to be the norm in Fargo. The idea we get from the now famous movie by the same name, is a picture of a town that is somewhat behind the times. But Funky Junque is far from that. It in fact, it may be a little ahead of it's time. Funky Junque, a store owned and operated by Kriss LeCocq, is filled with wonderful vintage finds, lovingly married with many new items. 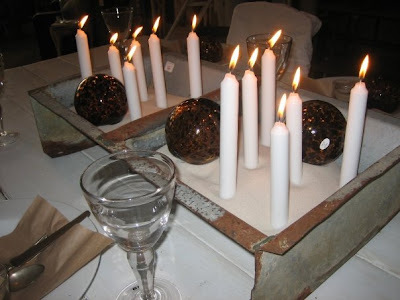 You'll will find great vignettes displaying old rusty farm pieces refurbished as candleholders, chicken feeders filled with sand and tapered candles used as a table centerpiece, and large church windows used as a backdrop to a picnic table. You will also find shelves loaded with many new items such as dinnerware and glassware, tablecloths and rugs. 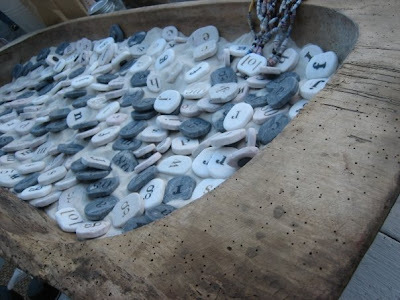 Clothing and jewerly are also some of the items you'll find. 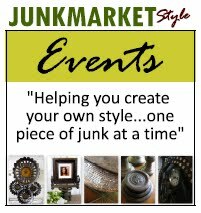 So if you happen to venture to Fargo, you are a current resident, or just want something to do, be sure to check out Funky Junque. And don't forget to say hi to Kriss, and tell her Lanette sent you, ya sure you betcha! Simple Table setting - Love the Orange! 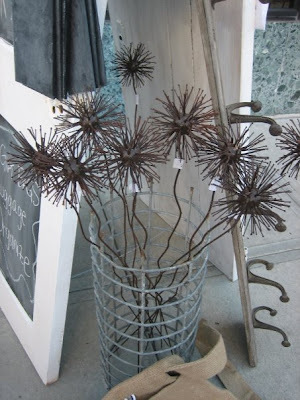 I fell in love with these metal Allium flowers! Kriss' Funky Junque is located at 516 Broadway N.Fargo, ND 58102-4417 or you can contact her at 701-235-9600. Her website is http://www.funkyjunque.com. 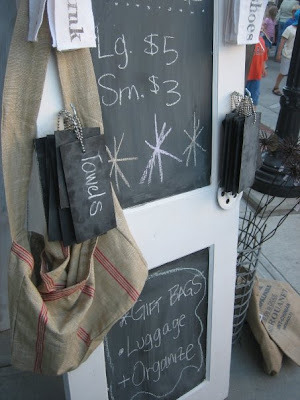 Love, love, love the look of this store and all of the great stuff in it. I tried very hard to get there when I was speaking in Fargo. I'm so sad I missed it. May be time for road trip! Thanks for sharing this. My mom was born and raised on a farm in North Dakota! I went to Fargo several times as a kid to visit relatives! I wish I could go to this store! My kind of place! Hi, Lanette! What a cool looking store! Guess we know where you'll be spending some time when you go to visit your son from now on :)!! Hope you had a fun visit! So many ideas in the photos! I would love to stop in a store like this. I like funky junque! The simple white candles standing in the sand is great! I was in Fargo in April and happened upon Funkyjunque but to my dissapointment it was Sunday and it was closed. That however didn't stop me from pressing my nose to the windows in an attempt to gawk at the slendor inside. Thanks for the pictures. HOw cute is that store!! I wish I lived close by I would hop right on over there! What an unbelievably beautiful shop!! I am drooling over the photos! In fact, I want those incredible windows in the background!! I have a fun give-away going on with Ki of Junk Revolution, and I would love if you would join in, and especially if you would help spread the word about the contest. You have so many junking fans, I think it would be right up their alley!! 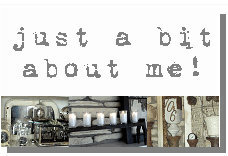 Lanette -- I left an award on my blog for you today :)! Come by to check it out! Fabulous. I'm ready to hit the road to Fargo. Thanks for sharing this wonderful store.